The Loop is closed. Life is returning to normal when the pastoral countryside is suddenly flooded by dark water from the huge abandoned underground facility… the past is not ready to be forgotten. 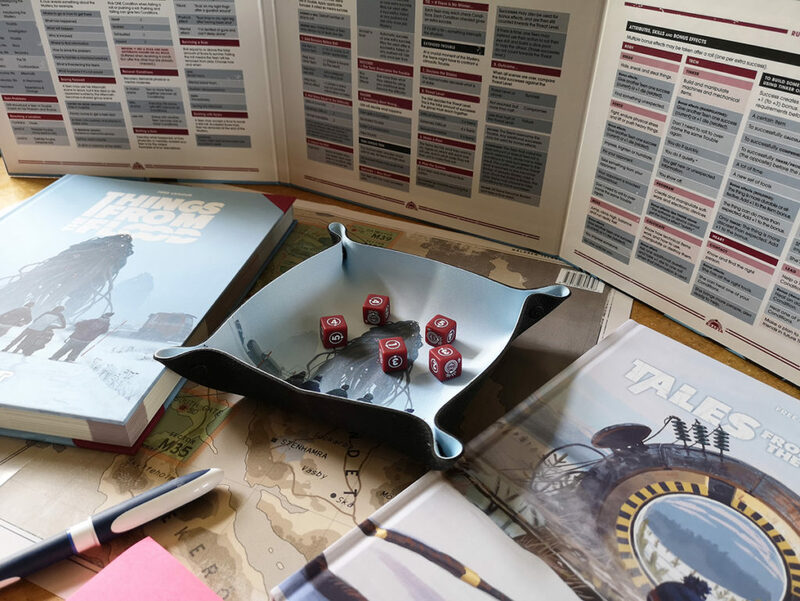 It was a pleasure to work with Free League bringing an additional themed touch to the gaming table in the form of the official Things from the Flood folding dice tray. 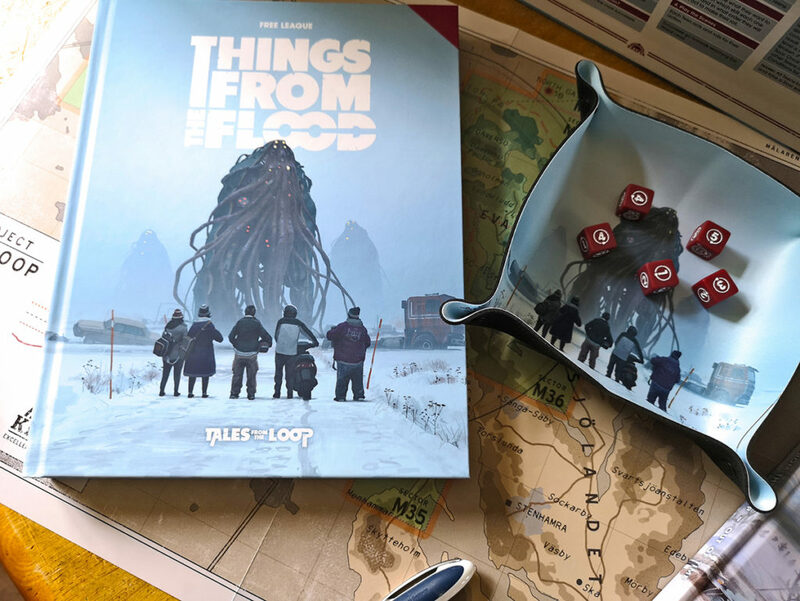 This week many of you will have received your Kickstarter package; amidst the books, bubble wrap and clam-shell-sealed dice, you will find the memorable image of five youths faced with a monstrous mechanical entity printed on one of our original snap-cornered dice trays. You might also note the special snaps with the ‘n’ logo — the branding of our sister company Snap ‘n’ Roll through which we handle mass fulfilment of white label gaming accessories. 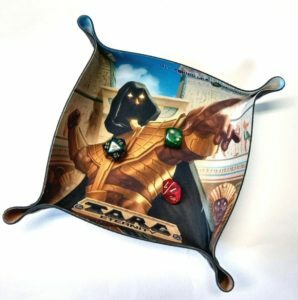 However, have no fear — each dice tray had been hand-finished, printed on quality neoprene with vivid colours. Since we first came up with the idea, we’ve always been determined to maintain that level of quality because it matters to us — we’re gamers, too, and we wouldn’t settle for second best at our table. 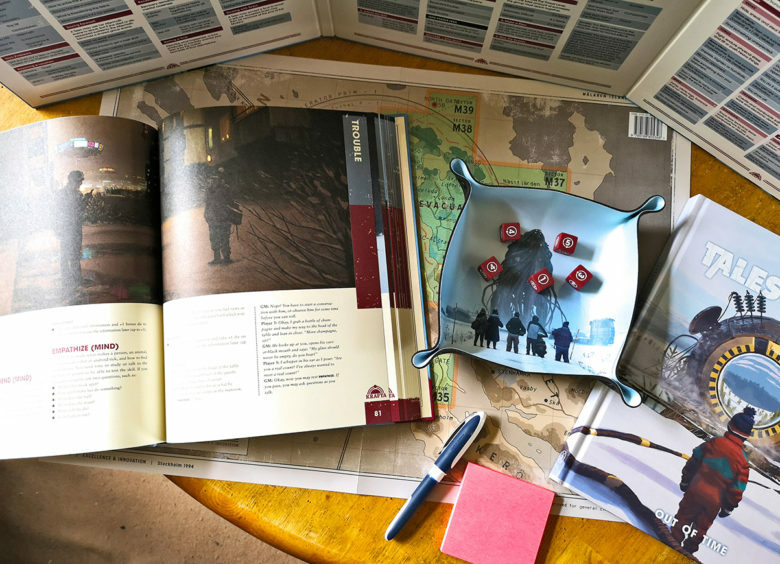 If you’re putting together the pledge levels, stretch goals or add-ons for a crowd-funding campaign, we’re happy to talk about providing quality must-have accessories, whether All Rolled Up game rolls, folding dice trays, fabric map panels or messenger bags — contact us.